Cloud Baby Monitor turns your iPhone, iPad, iPod touch, Mac, Apple TV, and Apple Watch into an easy to use, reliable, and secure Video Baby Monitor. Keep one device with your baby and watch live video with crystal clear audio on your other devices. 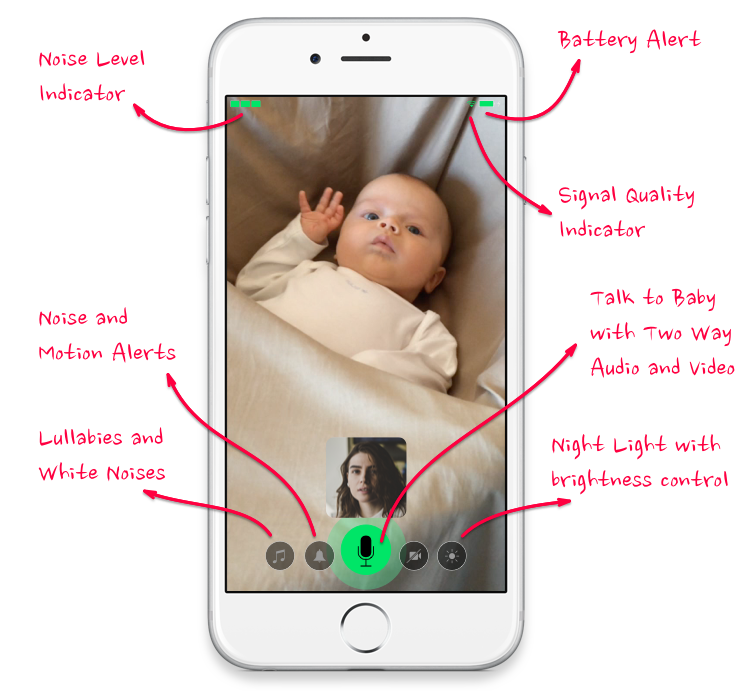 Get notified about all your baby’s activities with noise and motion alerts. 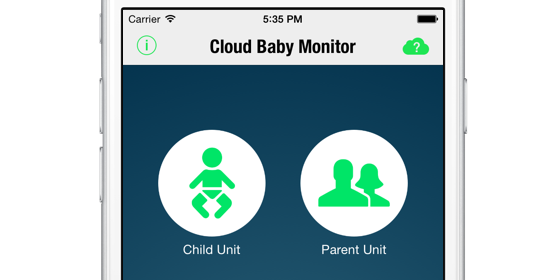 Download Cloud Baby Monitor app to two or more Apple devices. Either of the devices can be an iPhone, iPad, iPod touch, Apple TV, or Mac. Start the app on two devices. Select Child Unit on the device that stays with your baby. Select Parent Unit on the device that stays with you. Enjoy high quality live video and audio of your baby on your home WiFi network. Works over Bluetooth in areas without WiFi coverage. Enjoy the same quality live video and audio when you need to leave your house. Works over 3G, LTE or any other WiFi network. Get notified about all your child’s activities with noise and motion alerts. The alerts are automatically pushed to your Apple Watch. Soothe your baby with built in popular lullabies and white noises. Create your own playlists with lullabies and white noises from your iTunes Library. See your baby sleeping through the night in a dark room. Adjust brightness to get a great picture while not disturbing your baby. Soothe your baby easily from anywhere around your house. When both parents are monitoring each of them can talk to baby independently. Switch off video when sleeping through the dark nights and change your baby monitor parent device into a beautiful night clock. Get live video, motion and noise alerts right on your wrist. Works as a glance, as a standalone Apple Watch app and provides rich notifications. Monitor your baby at the same time from multiple devices. Monitor multiple children from one parent device at the same time. Get notified when child or parent unit battery level gets low. Always get the best reception and smooth live video and audio. Works as a child unit or parent unit on all iOS devices running iOS 7 and newer. This includes iPhone 4 and newer, iPad 2 or newer, and iPod touch 5 and newer. Works as a parent unit on all models of Apple Watch. Requires iPhone 5 or newer running iOS 8.2 or newer. Works as a child unit or parent unit on all Mac computers running OS X 10.8 Mountain Lion or newer. Supports any cameras compatible with the Mac. Works as a parent unit on the Apple TV 4 or newer running iOS 9 or newer. I have been using this app with an old iPhone mounted in the nursery, and this is our only baby monitor. With this app, I’m able to watch the babies from anywhere in the world on any iOS device or my Mac. The app works really well and the quality is great. Overall, this app has been incredible and has saved me $200+ from buying a dropcam or a dedicated baby monitor. The best app on the market!! Works amazing!! Love love love this app!! Will literally save you $100+ on an actual baby monitor. Highly recommend this app. Cannot recommend this app enough. It has bee rock solid for us, and it's easily worth several times more than the purchase price. I just wish it had infra red night vision, but that's a limitation of the phone, not the app. Fab!! Wouldn't be without it!! Genuinely cannot recommend this app enough, it's just fantastic. The range is second to none - especially comparatively to my physical Motorola Baby Monitor! I use my iPad as the child unit and iPhone 6+ for the parent and it's been faultless! Love the ability to turn on the front camera light to check on bubby without the need to mount the stairs, the lullabys and nightlight moon/star display features are brilliant too! I haven't found another similar product that's even remotely in the same league! Now with unlimited range it truly is just brilliant!!! We returned the baby monitors we bought for our baby because we had no use for them with this app. We keep an old iPhone set up as the baby unit. Works great and saves money. Plus with family sharing you're able to purchase the app only once and download it to multiple devices. The application works very well. If for any reasons, it presents any malfunctioning, you will find the best costumer service ever! ...and problem solved! What is Cloud Baby Monitor? Cloud Baby Monitor is an app that turns your Apple devices into a reliable and easy to use video baby monitor. One device (iPhone, iPad, iPod touch, or a Mac) - the child unit - is left with your baby to capture the video and audio. The other device (iPhone, iPad, iPod touch, Mac, or Apple Watch) - the parent unit - is kept with the parents to either watch live video and audio, or get notified when child unit detects noise or motion. Both devices connect by default over your home WiFi network, or Bluetooth. Optionally you can enable Cloud Baby Monitor Unlimited Range to let the devices connect over 3G, LTE, or any other WiFi network outside of your house. What devices are supported by Cloud Baby Monitor app? 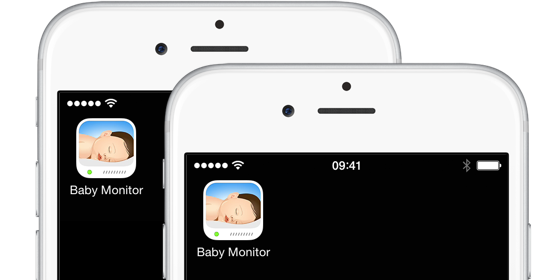 Cloud Baby Monitor works on all iOS devices running iOS 7 and newer. This includes iPod touch 5th generation and newer, iPhone 4 and newer, and iPad 2 or newer. Cloud Baby Monitor for Apple Watch requires iPhone 5 and newer running iOS 8.2 or newer. Cloud Baby Monitor for Mac works on devices running OS X 10.8 (Mountain Lion) and newer and includes support for Mac built-in cameras as well as any supported third party USB cameras. Cloud Baby Monitor for Apple TV requires 4th generation Apple TV with the App Store or newer running iOS 9 or newer. As of September 2015, Apple stopped supporting development for devices older than iOS 7. Our latest app updates are therefore available only to the devices running iOS 7 or newer. To install Cloud Baby Monitor to your iOS 5 or iOS 6 device, first purchase it on the iOS 7 or newer device, and then download it to the older devices via AppStore/Purchases. Please see more details here: https://support.apple.com/en-us/HT201377. Do I need to pay multiple times to get Cloud Baby Monitor to all my devices? Any iOS app that you purchase can be installed on up to 10 iOS devices as long as they all use the same Apple ID for app purchases. You can verify the Apple ID your devices are using by going to Settings / iTunes & App Store section. Typically you purchase the app on the first device and then install it for free to all other devices. When your devices use different Apple ID for app purchases you either need to purchase the app on each device separately or you might consider reconfiguring the devices to use shared Apple ID for purchases and separate Apple ID for iCloud backup, iMessage, FaceTime, etc. Starting with iOS 8 you can also use Family Sharing to purchase the app under one Apple ID account and then install it for free on up to six other family accounts. Learn more about your Apple ID here: http://support.apple.com/kb/HT4895. Learn more about Apple iOS Family Sharing here: http://www.apple.com/icloud/family-sharing/. Why do I need to pay extra to get Cloud Baby Monitor for Mac? Apps for Mac and iOS can not be at this time combined into a single purchase. Apple is running two stores, the iOS App Store and the Mac App Store, and developers supporting both iOS and Mac need to build two separate apps and sell them through those two stores separately. The apps purchased through either store can be installed on up to 10 devices of the same type as long as the devices use the same Apple ID for app purchases. How secure is Cloud Baby Monitor? Cloud Baby Monitor uses by default only your home WiFi network or bluetooth to transmit live audio and video between the devices. No internet connection is required. When you opt-in, and enable Cloud Baby Monitor Unlimited Range, essentially connecting back to your home WiFi network over 3G, LTE, or from any other WiFi network (for example from your neighbor's house), the app will establish the shortest path between the devices to transmit audio and video. In that case, the audio and video will be transmitted over the internet. All communication between the devices is always secure, interference free, and protected by industry standard encryption to make sure that you and only you have access to your baby video stream. What range does Cloud Baby Monitor have? Cloud Baby Monitor uses by default only your home WiFi network or bluetooth to transmit live audio and video between the devices. The range is defined by your home WiFi network coverage or bluetooth range. Learn more about WiFi and Bluetooth range here: http://support.apple.com/kb/HT1365. When using Cloud Baby Monitor Unlimited Range, the app will work anywhere where you get a decent internet connection. We support monitoring over Wi-Fi, 3G, and LTE. How much data do I need when using Cloud Baby Monitor over 3G or LTE? When monitoring over cellular data connection (3G, LTE), the parent unit device automatically switches off the video to save cellular data consumption. You can switch the video on and off manually as needed. One hour of audio only monitoring typically consumes around 30MB of data. One hour of audio and video monitoring typically consumes around 100MB of data. How long will the battery last when using Cloud Baby Monitor? Using Cloud Baby Monitor for audio and video monitoring requires both devies to be running with their screen on. The battery in this case will last for about 2 hours on the iPhone and 4 hours on the iPad. Using Cloud Baby Monitor for audio only monitoring allows you to manually switch the screen off on both, child and parent unit device. In that case the battery will last for about 6 hours on the iPhone, and 8 hours on the iPad. Your mileage will vary depending on the age of your device, quality of signal and many other factors. How to use Cloud Baby Monitor when monitoring at night? The cameras built into Apple devices are not sensitive to infra red light that ise required for true night vision. This means that iPhone, iPad, and Mac are not able to capture video in the dark unless there is a source of regular visible light. Cloud Baby Monitor uses the child unit device screen or camera flash to generate light for the camera to see. The brightness of the light can be remotely controlled from the parent unit to illuminate the room just enough to see and to not disturb the sleeping baby. How to use Cloud Baby Monitor on Apple Watch? Using Cloud Baby Monitor on the Apple Watch is super simple. Start monitoring on your iPhone, press the sleep button to switch off the screen and keep the iPhone in your pocket. Then swipe up on the Watch to reveal a Cloud Baby Monitor Watch Glance or start a Cloud Baby Monitor Watch App and you will get the live video and noise level indicator right on your wrist. You can also enable noise and motion alerts on your parent unit and get them automatically delivered to your Apple Watch. When the noise and motion alert is received on the Watch, the screen automatically starts showing live video and noise level indicator. Copyright © 2016 Martin Man. All Rights Reserved.